Borough municipal offices are located at 2 East Third Street, Lewistown PA 17044; phone 717-248-1361. Photo: McCoy House, ca. 1836/1843, 17 North Main Street, Lewistown, PA. Listed on the National Register of Historic Places in 1973. Photographed by User:	Pubdog (own work), 2010, [cc-by-1.0 (creativecommons.org/publicdomain/zero/1.0/deed.en)], via Wikimedia Commons, accessed January, 2014. The borough of Lewistown, the county seat of Mifflin County, is situated on the north bank of the Juniata River at the mouth of the Kishacoquillas Creek. This is near the head of the famous narrows of Shade Mountain where for several miles the river, railroad tracks and old turnpike alone find room for passage between the high and rugged ranges. The town is picturesquely located in one of the narrow valleys formed by the folds in the Allegheny Mountains, along the base of one of the limestone ridges of this part of the state, and lies almost wholly on elevated land. This situation is almost central between Harrisburg and Altoona on the main line of Pennsylvania Railroad, 60 miles distant from the former city and 71 miles from the latter. The first white settlers to locate in this vicinity were of Scotch-Irish descent, arriving about 1750. They soon discovered the promising advantages and opportunities of this section and began negotiations with the Indians for the purchase of valuable lands, which were finally effected. The Indians, however, soon became dissatisfied with the conduct of the whites and this led the latter to build Fort Granville, just above the site of Lewistown, for their protection. But the fort was captured in 1756 and burned. The whites had fled for safety but when peaceful conditions were restored, returned and established a trading post and tavern. In 1762 members of the Buchanan family secured from the state grants for considerable land near the junction of the Kishacoquillas Creek with the Juniata River and comprising practically all the land on which Lewistown now stands. The place having been selected as the county seat of Mifflin County, Samuel Edmiston, with considerable thrift and foresight, purchased 300 acres of land and began laying out a town. Lots were set apart for schools, a court house, jail and cemetery. Mr. Edmiston being a modest man, is generally credited with giving the town the name of Lewistown in honor of a friend named Lewis, who was an iron manufacturer in this section's early history. Development began actively, there being 70 lot holders in 1793, according to the assessment roll of that period. 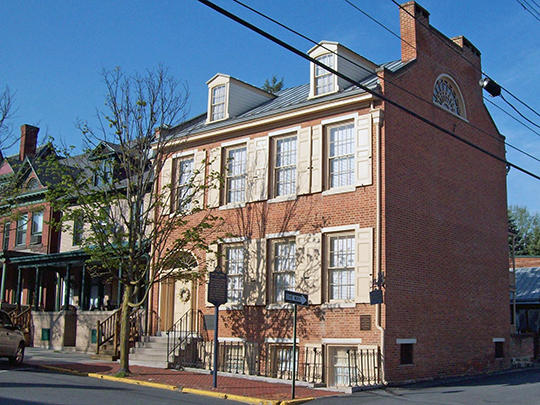 The town continued to grow rapidly and in 1795 was credited with having 120 dwellings, a court house and a jail, and has always been the county seat of Mifflin County. Supplies for this community were originally brought on pack mules over the mountains and later by boats on the Juniata River. In 1817 the turnpike was opened to this point and eventually became a state highway between Philadelphia and Pittsburgh, Lewistown becoming one of the prominent stopping places for stage coaches and Conestoga wagons. In 1829 the canal was opened and the borough became an important shipping center. Lewistown was the western terminus of the Pennsylvania Railroad for a time in 1849. In 1890 the borough had a population of 3,273; in 1900 it had 4,451 and in 1910, 8,166; in 1920, 9,849, and the estimated population today  is 12,000. Although no census record ever showed Lewistown to have taken a backward step, there was a reduction of several hundred in population following the industrial depression in 1907. The Kishacoquillas Creek drains the valley to the northwest breaking through Jacks Mountain at Mann's Gap, about six miles above Lewistown. Along its course there are a number of towns, forming practically a continuous settlement from Lewistown to Reedsville, about seven miles up the stream.